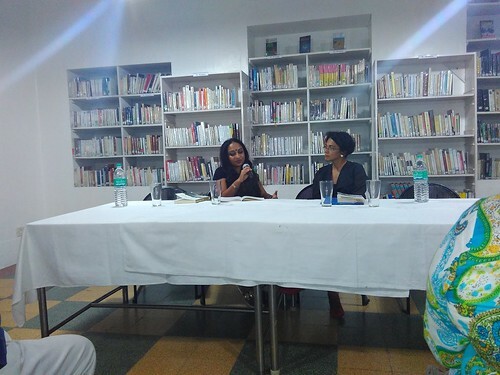 I went to Karthika Nair’s (right) “Until the Lions” book release event at Alliance Française of Madras, Chennai on 20th Sept. ’15. The book is a poetic retelling of Mahabharata in the point of view of 19 lesser known voices. “Until the lions have their own historians, history will always glorify the hunter.” — Chinua Achebe. Karthika Nair is obviously a poet, but she is also a Dance Choreographer and Producer. She says that her poetry is partly inspired by movement (of dance)! Other inspirations include B. R. Chopra’s Mahabharat serial in DD channel in the late 80s (the arrow multiplying with each frame one) and even Dhalapati Tamil movie, which revisits the equation between Duriyodhana and Karna — that’s an interesting view! I guess most of us know the broader narrative of Mahabharata, but not its deeper intricacies, definitely not in the eyes of the minor characters — that too in poetic form. The 19 or so voices (characters) seek to connect with the readers in their own emotional tones — that’s a difficult feat to pull off, don’t you think? The author read three excerpts of poems from her book — one was violent, one was terrifying, and the third made me empathize. It seems Satyavati is the dominant (narrative) voice, and there are other voices like Kunti, Amba, Mohini, and even a dog! Surprisingly Draupadi’s voice doesn’t appear as the author felt there were so many works that feature Draupadi prominently. As pointed out by an audience member, the narrating of the poems by the author with appropriate emotional tones was an interesting experience, and we were not sure if we’d get the same feel while reading. But the author pointed out that while reading, we are our own narrator, and hence that’d be interesting too. I think the author can create an audio book version by narrating the book in her own voice.